What does Rent to Own actually mean? What is the Rent to Own process? Do appliances or furniture come with a rent-to-own home? What if I have bad credit? Can I still get a rent-to-own home? Is there a down payment on a rent to own home? What are the benefits of a rent to own home? What are the requirements of a rent to own arrangement? In most cases, a rent to own agreement is a contract on a property that works like a lease and leads to a purchase. It’s often called a lease with an option – or a lease/option agreement for short. The lease portion is a standard rental agreement that includes monthly rent, security deposit, and other typical terms. The option in the contract gives you the right to purchase the property after a set time period – usually around 3 years. This gives you the ability to save money towards a down payment, repair credit, increase your income, or otherwise improve your ability to qualify for a mortgage. Most of the time people use a traditional mortgage loan to purchase the property prior to the expiration of the option period, but there are other options if your financial situation has unique needs. We help lots of folks like you to purchase the home of their dreams. Fill out the form below to get started on your way to home ownership! The rent to own process is actually pretty simple. Once you’ve seen one of our fantastic properties, we’ll give you an application to fill out. Don’t worry – we help people with all kinds of credit and financial situations, and if you can afford the property, we can probably help you to own it. After you’re approved to rent the property, just sign the lease, pay your security deposit and rent – then move on in! Your lease/option agreement (also known as the rent to own contract) will spell out the length of time that you have to complete the purchase of the property – typically 3 years, but in certain circumstances we may extend your option if you need more time. The purchase of your home usually takes place through a traditional mortgage loan, but there are other ways to complete the purchase, depending on your finances. Once you’ve completed your mortgage, you’re done – now you own your home! First step – sign up to find great properties around Carson City just by filling out the form. 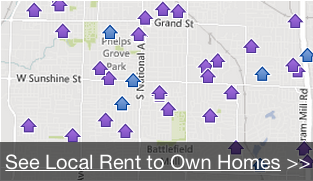 You’ll get immediate access to great rent-to-own homes, plus a whole lot more. Most of the time, furniture isn’t included with a lease/option purchase. Generally, the basic appliances are there – like a refrigerator, stove, oven, and sometimes extras, like a dishwasher, a washer and a dryer. Parts of a property that are installed or attached – like the heating system and air conditioning – are definitely included. Sometimes, we’ll offer a property that includes some furnishings. Most buyers want to bring their own stuff with them from their previous home, and that’s why furniture is sold separately. There are many companies out there that provide a rent-to-own service for furniture or extra appliances, and you’ll get lots of choices on styles and types. Even though rent-to-own real estate can be a great deal, some (not-so-honest) furniture companies will charge you huge amounts for a rent-to-own agreement. You might end up paying 2-3x more for these products than if you bought them outright. Plus, those appliances will probably go down in value – unlike real estate, which usually goes up in value. Of course, you want your money to be going to an asset (like your home) that will rise in value, not expensive interest payments on new furniture. So don’t wait! Fill out the form at the bottom of this page to get started now. Yes you can! Many people with bad credit can still get a rent-to-own home. Every situation is different, but we specialize in helping people who have been through tough circumstances (or just made mistakes in the past) to repair their credit and get started on the path to a great financial future. Even if your credit is bad, you can still own a property! One of the major benefits of a rent-to-own scenario is that it gives you time to repair your credit before you purchase your home. You’ll enjoy many of the benefits of home ownership while you’re rebuilding your credit and saving money towards a down payment. So fill out the form at the bottom of this page now and get your piece of the American dream! There are a lot of benefits of a rent to own agreement! In the Carson City area, lots of smart people are using rent to own agreements as a way to get the home of their dreams without having to qualify for a bank loan right away. In the past few years, banks have been very tight on their lending criteria. Most people who use a rent to own agreement want a few years to get ready to qualify. Try before you buy! You get to live in your rented home before you actually purchase it, allowing you to make sure it’s actually your dream home. If you don’t like the house, you don’t have to complete the purchase. Own without great credit or a big down payment. You can start feeling like a homeowner right away while saving up and improving your credit. Privacy. You’re not listed as the purchaser on any public records until the closing takes place, giving you years of privacy. Move in fast. Since you don’t have to wait for a mortgage, you can often move in right away – and get started living a new life in the home of your dreams! So don’t wait! Get started now by filling out the form at the bottom of this page. You don’t have to have a down payment until your purchase is complete (typically 3 years). However there is usually an amount due upon move-in and execution of the option to purchase agreement. Just like any other lease agreement in Carson City, there may be a security deposit and a small application fee in addition to the fee upon move-in . Of course, you’ll have to pay rent each month. We can help you to structure the perfect scenario to meet your needs. We’ll show you the rent-to-own calculators and formulas that we use when we prepare your agreement, and help you figure out what’s best for you. We know that every person, family and situation is different. We do our best to help you uncover creative solutions to help you own the home of your dreams. Once you’ve had a chance to check out the house, you’ll fill out a rental application that will include detailed information on everyone living in the home. We’ll conduct a credit check and verify the income(s) for everyone over 18 who is living in your household to confirm that you’ll be able to make your monthly payment. People with bad credit, no credit, limited cash available, and other financial situations have all been able to lease then purchase their perfect piece of real estate. We’ll speak with your references and previous landlords, because relationships matter to us more than just scores assigned by a computer. We love helping great folks to reach their dreams, so don’t be afraid – fill out the form below to get started! I had saved some money and I wanted to get out of our apartment with my two girls. Kristi helped us be able to have a home with a small yard, and now we are looking to move up into one of the larger homes she has. She did what she said she would do, and even fixed something that went wrong in the first month, even though she didn’t have to. We had a good experience and hope Kristi can help our friends get a house, too. My wife was pregnant with our fourth child, and we desperately needed to move into a bigger home. I had a good down payment, but no bank would give me a loan. Kristi made it possible for us to move in to a 3 bedroom/2 bath home before the new baby came. It was one of the best things that ever happened to us. Thank you, Kristi, I have other people I know that could use your help. LEGAL DISCLAIMER: Rent To Own refers to properties for sale with lease-option or seller financing. This site does not charge for rental listings and is not a Pre Paid listing Service as defined by California Business and Professions Code 10167.